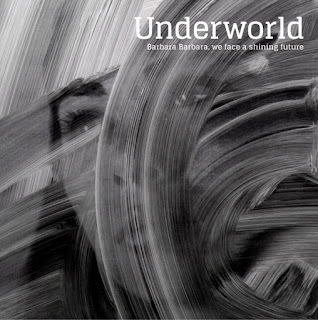 Underworld release their 7th studio album and true to their ethos it's not what you'd expect from the main stage headliners. I was a relative newcomer to their album work, I only really knew the handful of "hands in the air" trademark arpeggiated synths which they seem to have one or two per album (listen to their live album Everything, Everything - quite possibly the best live album ever released) and to my unappreciative ear back then, just some oddball album fillers. It was only when I picked up Beaucoup Fish in a charity shop a few months ago that I properly listened to one of their older albums right the way through and got a proper understanding of what they were about. Barbara Barbara, We Face A Shining Future (apparently one of the last things Rick Smith's father said to his mother before he died) opens with I Exhale, a simple, moping drum beat which leads into distressed synths and electric guitars followed by Karl Hyde's nonsensical lyrics. The track meanders really nicely over the course of 8 minutes with various distorted synths and samples. If Rah picks up with I Exhale left off, with another slower beat with more off the wall vocals. This plods along until around the 3 minute mark when the first sign of the synths Underworld are known for pop into the mix. There's a breakdown which builds up really nicely and kicks back in for the climax of the track - really looking forward to hearing this at Forbidden Fruit this June. Low Burn then kicks in, this song could have easily finished out the album, its a 4/4 kick and could have been produced by them anytime over the past 15-20 years. It has that epic* end of set feeling that puts you in a trance, you can just imagine closing your eyes and getting lost in it. Santiago Cuatro is the interlude track, a Spanish Guitar freestyle over some synths - they insist on putting one of these weird tracks on all their albums, at least on Barking they had the decency to make it the final track on the cd so you could just take it out when it came on. Motorhome is just a track to ease you back in the room after the snorefest of the previous song. Ova Nova then picks things up again back into familar Underworld territory while Nylon Strung finishes the album off with 7 minutes of glorious house music. It's only 7 tracks long but all of them (barring the skippable Santiago Cuatro) are on average 6/7 minutes long and when you're listening to them, don't feel that long at all. *I dont mean epic in the 16 year old teenager type of way, I mean it in the true sense of the word! !